As part of JUMP’s ongoing initiative to reach out to those who have served in Japan, JUMP intern Kevin Yuan interviewed Gary Williams, who served in Okinawa from 1968-1971 as a Junior NCO with the US Army. Following his 26 years serving in the Army, he spent another 24 years working as a civilian employee of the US Army Corps of Engineers. 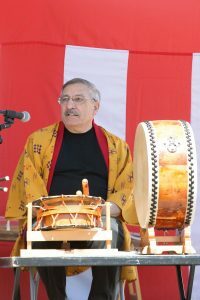 He is a self-taught taiko drummer and currently performs with two Okinawa performing arts groups in Washington, D.C. and Virginia Beach. How did you learn about JUMP? I learned about JUMP on Facebook and decided to join after reading an article. What were your perceptions about Japan, before and after serving in Okinawa? I really didn’t have many perceptions about Japan before I was stationed in Okinawa; only what I saw in old movies and on news stations. I did see movies with my mother and aunt – The Teahouse of The August Moon and Sayonara – and remembered them quite vividly. I would say I was probably enchanted by the movies, but I was only 11 years old at the time. Before Okinawa, I was stationed in Thailand from 1967 through 1968, and I think that experience alone opened my outlook on Asia. I met some really nice people in rural villages and they showed warmth and respect. The hospitality for us was overwhelming. In less than six months after returning from Thailand to the United States, I had orders for Okinawa, so I was ready for my second assignment abroad with only two years in the Army. Okinawa was something like Thailand in customs, but I would say more traditional in customs and values. I began working with seven Okinawa men on almost day one. I met my wife six months later and we lived in an Okinawa community off-base, so I was immersed in the community, their customs, and values. Do you have any advice to share with individuals getting ready to be stationed in Okinawa for the first time? My advice to newly assigned people to Okinawa is to enjoy the culture, its people, and its customs. Don’t panic. This is going to be your best assignment ever – yes, even better than Hawaii! Why? Because, the Okinawa people will welcome you and want you to partake in their culture. They are some of the most honest people in the world and the Golden Rule applies 24 hours. Be courteous to Japanese people all the time. You can do a short bow when entering a restaurant or a person’s business or house. Respect their flag when they display it on their Flag Day. And make sure you take off your shoes when entering a person’s house or some restaurants. These little things mean a lot. Try to meet Okinawa people and remember their names, and give them the greeting of the day, whether it be at the USO or any place you frequently visit. You will be surprised by their overwhelming smile. Similarly, do you have any advice to share with service members who have served in Okinawa in the past and are looking to stay connected with Japan? I would suggest keeping a diary of your Japanese friends by name and their address. I tried to meet with my co-workers when I go back and I used to do that for a number of years, but I have lost contact since most have retired. I would also try to learn karate, learn jujitsu, or play the sanshin. All these groups have senseis that are linked throughout the world, and you can touch base with them on Facebook, which I do. Also, I would join an Okinawa non-profit group in the USA. You can share memories with members of these groups and share your talents as well. The same applies to martial arts clubs – they are everywhere. So join these clubs and dojos and enjoy the friendship. What is your favorite place in Okinawa? I would say Moon Beach, because that’s where I met my wife, Chieko. That’s also my favorite memory about Moon Beach – it’s where our life began. I met her at an Easter Sunday picnic hosted by our First Sergeant. Most of the junior leadership were invited with their wives and girlfriends. I came alone and so did my future wife, and about two weeks later we went on our first date. How did you get to become a Goodwill Ambassador for Okinawa? After joining the Okinawa Kai organization in 1996, Okinawa Kai senior members suggested my name sometime around 1999. At the time, only one other person was selected and he was Japanese, so I thought I was lucky. But I had also been playing Okinawa music for about two years as well, and I guess my interest in the music and culture was the determining factor. My favorite part about performing is looking directly into the crowd to see if they are smiling or attentive, and for the most part they are – especially those that have served in Japan or Okinawa. For some, it might be something they missed during their tour because of military needs, or their wives were busy raising a family. I look at the younger children and I hope I get someone interested in the art. I want to show them how much fun this culture is and to be proud of their roots, or for those who are not from Okinawa, to learn about this beautiful culture. Even some Japanese are not exposed, so they are enjoying it as well. Mission accomplished! How do you view the future of the U.S.-Japan relationship? It’s the greatest it’s ever been and seems to get better every year. Japan is one of our greatest allies. We constantly train with the Japanese military and we must continue to do so. We are their partner in Asia. The more we train together, the better we become at communicating with one another and supporting one another in future missions. We both must share our understanding of one another and know how to respond as a joint operating force. Socially, we as Americans need to become more aware of Japanese culture. 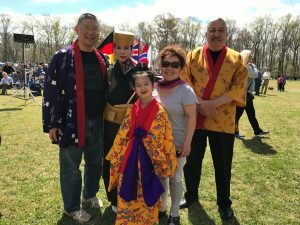 We are more similar than you would think – it’s just the language barrier, and you can overcome some of that by knowing the Japanese better than we do now. Actually, they know more about us than we do about them. They look up to America as a big brother, so we must learn more about them and treat them with respect. The best way to earn respect is to learn something about their culture, and to share that knowledge with them. Whatever I can do to spread Japanese culture, I am ready to do it every week if possible.